Grammy nominated* recording artists Norm Adams and Julia Robertson (formerly of the 90’s R&B group, ‘Ex -Girlfriend’) are spreading holiday cheer with “My Kinda Christmas”; an upbeat, light hearted ditty, reminiscent of the beloved classics that have defined the holiday season for generations. “My Kinda Christmas” is the story of a couple with a December dilemma; they each have a different idea about where to spend their Christmas holiday. She prefers to stay home and have a traditional celebration, while he dreams of jetting off to a tropical paradise for a vacation. As they each make their case to the other, they soon discover that they are at an impasse. So, for the sake of the relationship (and unbeknownst to the other), each decides to acquiesce, as she makes travel plans, and he invites family to the house. This creates even more confusion for the couple, who ultimately decide that where they spend Christmas is not nearly as important as how they spend it...together. 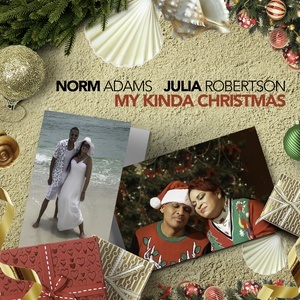 “My Kinda Christmas” is sure to be your kinda Christmas song this year, and for years to come.